The menorah standing in Cambridge Common, which a man toppled over Sunday in what police are investigating as a "possible hate crime." Cambridge police are investigating a “possible hate crime” after witnesses say a man intentionally toppled over a large menorah placed on Cambridge Common by student group Harvard Chabad. Two witnesses reported Sunday that around 3:30 p.m., a white male dressed in all black approached the menorah riding a black bicycle, Cambridge police spokesperson Jeremy Warwick said Monday night. The man then dismounted his bicycle, walked over to the menorah, and pushed it to the ground. Several bystanders stood the menorah back up shortly thereafter and then an older man led the group in a Hanukkah prayer, Universal Hub first reported. 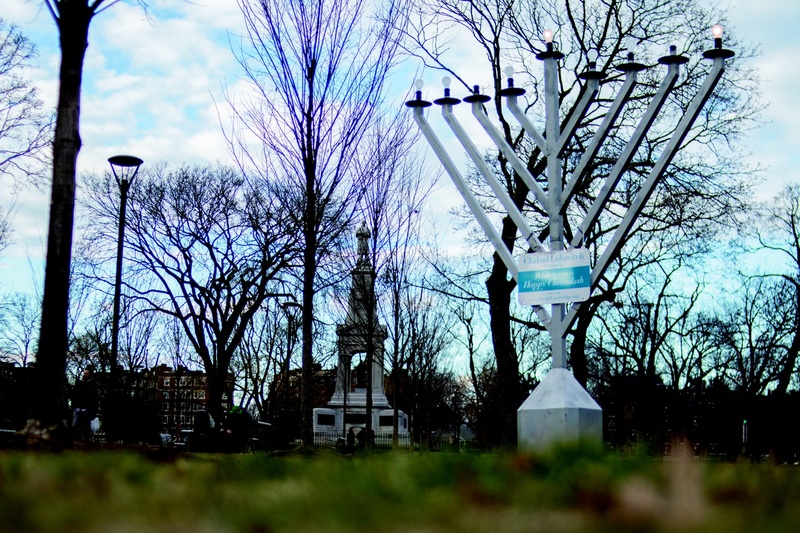 Rabbi Hirschy Zarchi, the founder and director of Chabad, said the organization has placed large menorahs on Cambridge Common and in other locations across the city for the past 19 years. Though the menorahs have been vandalized in the past, this is the first time it has happened “in broad daylight,” Zarchi said. “I wish I could say we’re shocked,” he added. Last year saw a nearly 60 percent increase in the number of anti-Semitic incidents reported in the United States — the largest single-year increase on record, according to the Anti-Defamation League. In October, 11 people died and six were wounded in a mass shooting at the Tree of Life Synagogue in Pittsburgh, Penn., the deadliest-ever attack perpetrated against Jews on American soil. And last week, a Columbia psychology professor’s office walls were vandalized with anti-Semitic graffiti. “Religious freedom means all faiths have to right to pray & celebrate without fear or intimidation,” the tweet reads. The Criminal Investigations unit of the Cambridge Police Department had not yet identified a suspect as of Monday evening, Warwick said. Incoming Harvard Hillel president Rebecca Thau ’20 said the executive director of Hillel, Rabbi Jonah Steinberg, has been in “constant communication” with the Harvard University Police Department since the Tree of Life shooting. HUPD has since routinely stationed a car outside of Hillel. Outgoing Hillel President Corey A. Gold ’19 said that though the incident left some students “very unsettled,” he believes most Jewish students feel safe at the University. “I think that HUPD and the Cambridge police are taking perceived threats and real threats very seriously, especially during this especially sensitive time for the Jewish community,” he said. “You see these wonderful people — wonderful people who we don't know and could be some even not of the Jewish faith — who were disturbed by what they witnessed and immediately sprung into action to restore it and to bring the menorah to its full glory,” Zarchi said. Chabad student presidents Gabriela J. Siegal ’20, Anne A. Rosenblatt ’20, and Hannah K. Harris ’20 wrote in an email that they “condemn this act of vandalism,” but nevertheless will continue with their Hanukkah celebrations.